The Kona Aggressor II is an 80 ft. catamaran, built and powered for comfort, safety, and stability and certified by the U.S. Coast Guard. She sleeps 14 guests in 5 Deluxe cabins and 1 Quad cabin on the upper deck. Each cabin has ensuite private toilet and shower and individual climate controls. The Kona Aggressor II has a spacious salon and 50 ft. of sun deck. The sun deck features a “moon deck bar” with seating, lounge and deck chairs, stereo and CD player, and shaded wet bar and grill. Her diving amenities include freshwater rinse showers, camera tables, and Nitrox. The Kona Aggressor II operates out of downtown Kailua-Kona. The Kona Aggressor II offers a week of hassle-free diving along the western coast of the island at favourite sites like Paradise Pinnacle, Tubestria Tunnel, The Hive, Turtle Pinnacle and Rob’s Reef. The yacht ventures far from the reach of day operators to beautiful South Point, the southernmost tip of Hawaii, weather permitting. The yacht departs the Kailua-Kona Pier Saturday evening with diving beginning Sunday morning and ending Friday afternoon when the Aggressor returns to port. Sunday through Thursday there is unlimited diving throughout the day and a night dive each evening. Friday a half-day of diving is offered. Friday evening, the crew hosts a sunset cocktail party at 4:30pm followed by dinner ashore. Saturday morning, guests check-out at 8am. 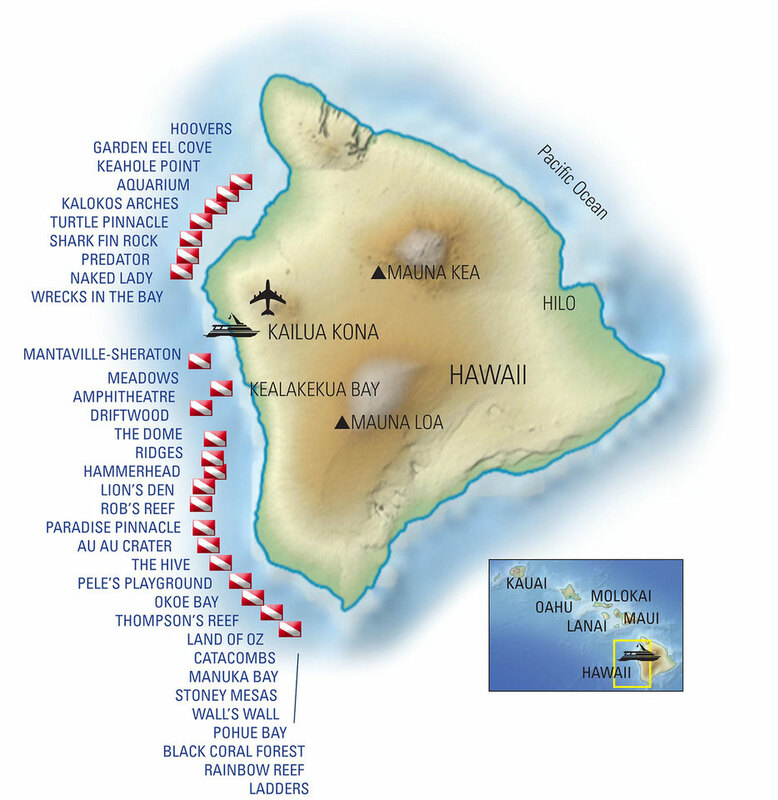 Prices include: 7 night/8 day cruise on Kona Aggressor II with up to 5 dives per day (inc night dive), tanks/weights/weight belts, all meals (except dinner on the final night), snacks and beverages (alcoholic & non-alcoholic).